This operation was intended to give me more contacts for the 6/10m challenge while qualifying as an entry in the VHF/UHF field day. Unfortunately I did not pack the 3el beam for 2m and a third length of coaxial cable. This limited my 2m antenna options and the range I could achieve. Radio wise I was in a good position at the “Katoomba” Lookout on Mt Alexandra, just north of Mittagong, south west of Sydney. 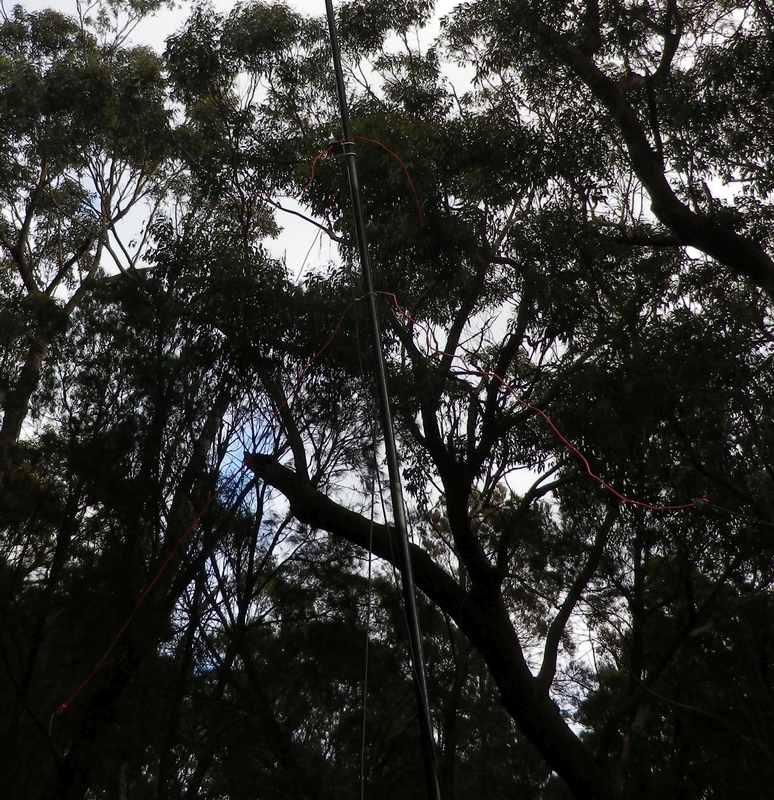 I could hear and work anyone others were working in the Sydney basin and also could work Geoff vk2ul in Yass and Gerard vk2io who was on various summits in the Blue Mts north of me. One North Sydney station could be worked easily on 2m and 70cm but while I could hear him well on 6m, he was unable to hear me and gave the (SSB) contact away. In a surprise Es contact on 6m I did work vk5kv who was s9 on peaks. Another station called CQ frequently on 6m and was replied to by several others closer to him, but he appeared to receive only very strong signals. He called CQ many times on 6m but never seemed to understand something was wrong. I wondered whether his receiver was faulty or perhaps his antenna system had high losses. After making about 20 contacts I moved to Mt Gibraltar. Another operator, VK2VOM, had been working there but had generator problems and was closing down. I was on the air at Mt Gibraltar by 4:30 pm but by then all the other portable stations except for Gerard vk2io had closed down. After spending 2 hours there and working Gerard on 6 and 2m and making very marginal contacts with Geoff vk2ul on 6 and 2, I was too cold to continue as it was around 2C and I decided to leave even though I had not made enough contacts to qualify the summit for SOTA purposes. Very disappointed in the low level of activity for the VHF contest. 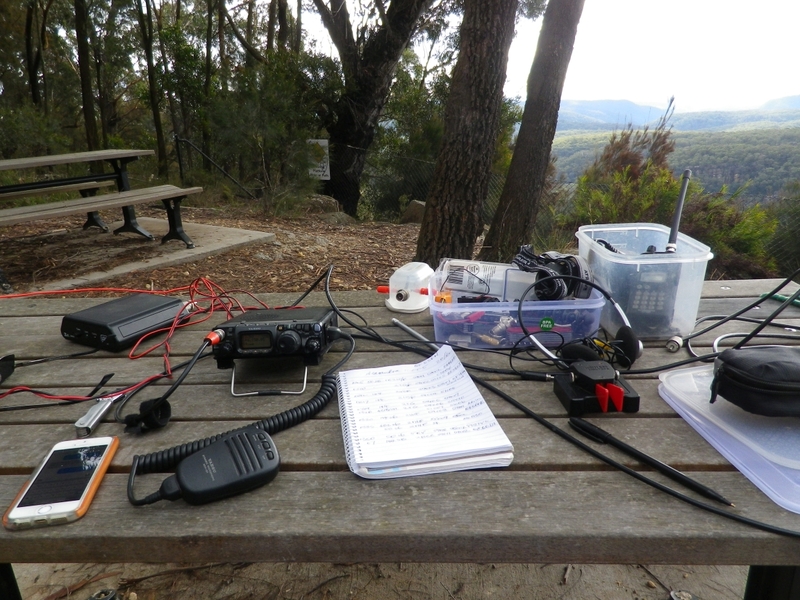 My gear was an ft817 at 5w running on a Lipo 3s and a LiFePO4 4s battery. At Mt Gibraltar I added a hl66v amplifier for 6m which should have raised my output power to about 30w. Antennas used were a wire dipole for 6m and a quarter wave vertical for 2m. Most of the 2m contacts were actually made using the 6m dipole. The operating position using a picnic table kindly provided by council. FT817 radio, iphone, ATU (not used), log book, morse paddle, boxes used to carry the bits in my backpack. No car access here, so you carry the lot. 6m dipole just visible (red wires) attached to squid pole.